Many organisations want to become more adaptive and to embed an ‘agile’ culture and this relies on effective decision making occurring at all layers within the organisation. A broad spectrum of skills underpin good decision-making including the ability to ‘cut through’ by analysing, verifying and clarifying. Imagining, perceiving and collaborating are core skills and synthesising, prioritising, planning and communicating are essential elements of good decision making. How can we simplify the decision making process? How can we speed it up? How can we provide more rigor? How can we improve decision making at all levels within the organisation? Janellis have an Executive Decision Support Tool that has been used for over ten years for senior leaders to navigate through some of their most complex challenges. Most teams like the simplicity and structure but others don’t like the words ‘tool’, process or framework as they feel as though they already have enough of these within their organisation. What is the main issue / opportunity? Based on the main issue / opportunity, what is the most likely outcome? Based on the main issue / opportunity, what is the worst-case scenario? Based on the main issue / opportunity, what is the best-case scenario? Based on these scenarios what are the likely impacts across the key areas of the organisation? i.e. People, Finance, Customers, Strategy, etc. What do we need to do now and what do we need to do later? Who are all the key stakeholders that we need to communicate with? How, who and when will we communicate? 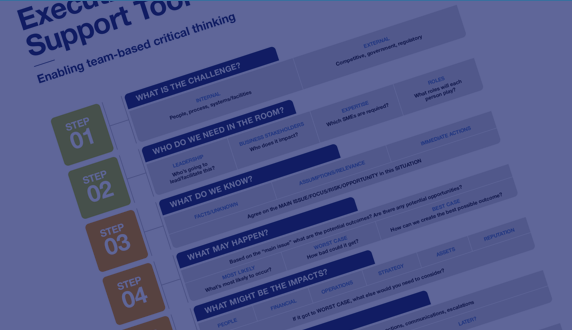 These steps may seem obvious and simplistic but debating the facts and assumptions is essential to cutting through to the main issue, particularly where there is incomplete or conflicting information. Data is an important part of getting to the facts and should be used to inform and support decision making but not dictate it. Challenging assumptions can highlight conscious and unconscious bias at the same time as drawing upon intuition and experience. The importance of this step cannot be overstated as the rest of the decision-making is often underpinned by how well this is done. “The overarching principle of productive thinking is that creative thinking and critical thinking have to separate. The productive thinking dynamic is the ongoing alternation between critical thinking and creative thinking. Imagine a kayak paddle. One side stands for creative thinking and the other critical. If you always use the creative thinking paddle you will go around in circles. If you use the critical paddle you go in circles the other way. The key is to alternate between the two. That way you develop enormous forward momentum”. In a group situation, by following the steps, it becomes clear who is more inclined towards creative thinking or critical thinking. Bringing a team together who have diversity of thought and experience, allows for teams to ‘toggle’ between critical and creative thinking in a way that creates momentum and produces more robust decision making. The benefit of using the framework is that is provides rigor for the individual or teams to ‘stay within the process’. This is particularly valuable where there are personal preferences and inclinations to stay too long in either the creative or critical thinking phase, running the risk of ‘going around in circles‘. If you would like to see or use our executive decision support tool or would like to attend one of our Critical Thinking Labs you can contact Jonthan.Durnall@Janellis.com.au.